This week the #SundaySupper family is talking all about healthy and fit lifestyles. I couldn’t be happier to be a part of this event with American Family Insurance because I’ve recently made a change in my own life to become more fit and healthy. This wonderful event is being hosted by Denise over at Run DMT. Thanks Denise for all of your hard work to make this event happen! I love AmFam and their #Choosedreams campaign. Supporting this campaign is special to me in its own way. I love how they support the #SundaySupper family and strive to always have fresh and healthy themes for us. I was so lucky to be a part of it in May. I made a Farmers Market Pasta and Herbed Chicken Kabobs. The thought of going out there and conquering my dreams is inspiring! Just in the past few months my life has changed in so many great ways. I accepted a part time job allowing me to work from home, I joined a challenge group that has me working out 5-6 mornings a week and I continue to search high and low for clean and healthy recipes for my family. I have young children and I want them to see how important it is to stay fit and to watch what we are putting in to our bodies. My daughter is now aware of my routine so if she wakes up before I’m done my workout she says very proudly afterwards “Mommy I waited for you to be done your workout before I got up!” How sweet is that? It’s only been 6 weeks but I plan on making this a way of life for myself and for my family. Knowing my almost four year old is actually seeing this lifestyle change melts my heart! What are some ways that you keep your family healthy and fit? Here are some ways that may be worth thinking about. We walk- My one year old loves his carriage, when he’s fussy…… we walk! We use all sports and seasonal activities– Swimming, biking, jumping in a bouncy house, sledding, soccer, swinging etc etc. Make outside time fun– There are many things to do outside summer or winter. Get out there and create games and fun activities! If you have kids try my Learning Numbers with Chalk game. It had me huffing and puffing with all the jumping! Park far away-No matter where we go I try and park far away, every step counts. Food Prep- Prepping your foods ahead of time can help you stay on track and it helps you serve those delicious healthy meals even when your super busy! Smaller Portions-This one has always been tough for me, being a foodie, I like to eat. So I cut portions down by only plating what we should be eating. If you fill your plate too much, you tend to eat too much. I also serve Chicken cutlets a lot because it’s the perfect portion size! Make Food Fun– Cut your fruits, veggies, sandwiches and any other foods you can into fun shapes. I have fruit cutters shaped in cute flowers, I use cookie cutters to cut through sandwiches to make them seasonal, kids are more opt to eat or try something if it looks fun!! I made a new recipe that follows any guidelines of the new healthy and fit lifestyle. I marinated my own chicken and made up a side dish was full of vegetables and flavor! Add the ingredients for the sesame chicken into a small sauce pan and heat on medium/high until it comes to a low boil. Continue to stir, turn to low and let the marinade reduce. About 10 min. Pour into a jar and let cool completely. Pour slaw into a skillet and pour a few tbsp of olive oil over it mixing the slaw as you pour. Heat on medium for about 15 min stirring a few times. While that’s cooking chop the tomato and process through a food processor. Add salt, pepper and garlic powder and pulse one more time to combine. Pour the sauce over the slaw and stir to combine. Sprinkle with red pepper (as much as you prefer) cover and cook for another 5-8 min. This step depends on how crunchy you want it. I can see how some people may not be able to see past the softness of a slaw, but I liked it softer so it felt like I was eating pasta. Don’t worry there will always be a crunch! Pour into a serving dish and sprinkle with Parmesan cheese. While the slaw is cooking, light the grill and place on medium heat. (bake or cook on stove top if you want!) Add the chicken and allow to cook for 5 min on one side. Flip and sprinkle with sesame seeds allowing the other side to grill for 5-7 more minutes. 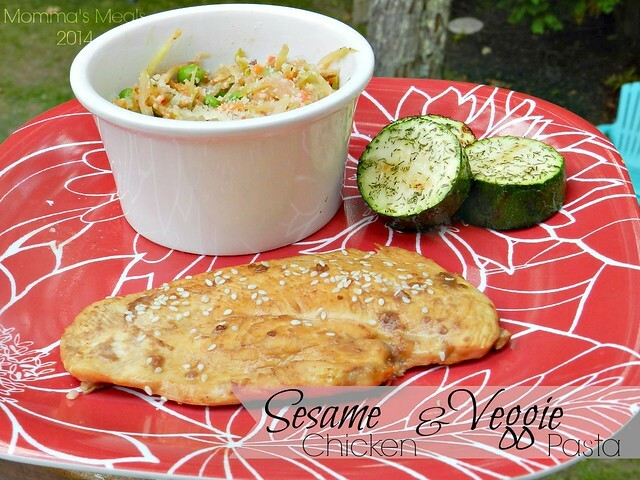 Place chicken on a serving dish and sprinkle the other side of the chicken with sesame seeds. I also served this dinner with cut up zucchini chunks that was tossed with olive oil and dill. 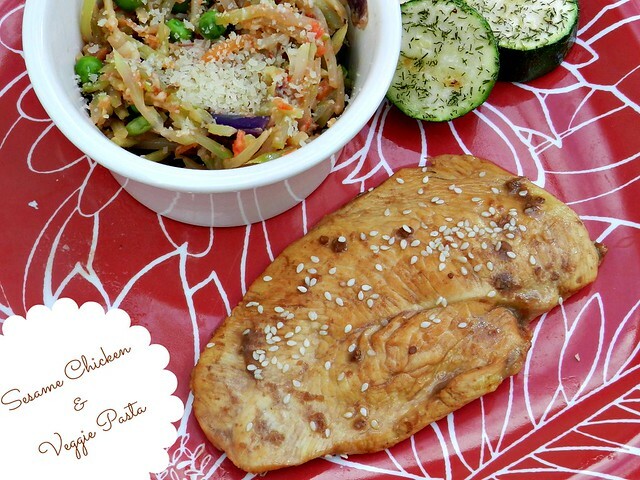 I loved eating this dish because I knew I was eating chicken and a WHOLE bunch of veggies!!! Now let’s check out the rest of the Family Healthy Fit Recipes!! 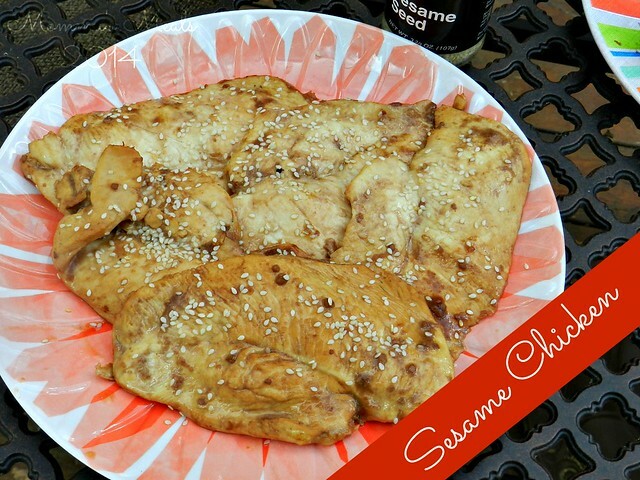 Sesame chicken is one of my husband’s favorites. I’ll certainly be trying this recipe and see how he likes it. What kind of fish, I don’t like any fish but I want to give it a chance again, if not for my kids!!??? Great recipe!! Sesame chicken is the best! What a fabulous meal! I could eat your veggie pasta by the bowlful. YUM! It was different but so flavorful!! I want to experiment and MAKE TONS! What a great recipe. Love it! Love the idea of using broccoli slaw as pasta!! This dish looks wonderful. Love that veggie pasta. This looks so delicious! I could go for a big plate right now! I love sesame chicken. With all those veggies, this recipe is calling my name! Looks wonderful! This recipe is just PERFECT! Clean, simple and so healthy and pinnable perfection! Thanks Denise! It’s been a great change for us, it’s hard to make it a part of our day with two young ones but I’m managing! Every little bit helps right! Love the park far away tip. I’ve been trying to do it more and more. Every step counts! This chicken marinade is so versatile. Great recipe! Thanks Lori! I love parking far away because your right, every step counts! This sounds like a wonderful meal and I’m really loving that vegetable pasta.